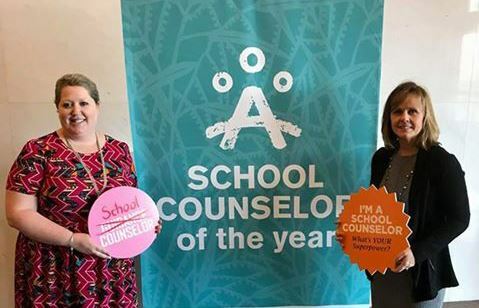 Each year, the Iowa School Counselor Association gives awards to certain individuals who have been instrumental in the field of school counseling during the previous year(s). These individuals are nominated by their peers and chosen by an independent panel who follow the various criteria for each category. Award winners are recognized each year at the annual conference. ISCA distinguishes several levels of recognition for outstanding leadership and development in school counseling programs throughout the state. Click on catergories below to learn more about these distinctions and the Iowa school counselors who have achieved the highest standards in our profession. Iowa SCOY representative Susan Schrader at ASCA SCOY reception.